[Click the image to hear Neil Young's new album in full.] Even if I didn't like all the results when Neil Young first donned a vocoder and got a synthesiser in 01982, when he put out a rockabilly album months later, followed by a country album, and so on, I liked the fact that he was brave enough to make life difficult for himself. While a lot of people were sniffy about his Greendale album three years ago, I saw him play acoustic versions of the whole album before it came out, and it was astonishing. The point being that, at 57 years old, most people would be looking to rest on past accomplishments, but Neil decided it was time to have a go at narrative performance art. And now that he's built a reputation for these curve-balls, his record company have finally realised that they can build on this, rather than always being painted as the villains of the piece. So the new myth is that Neil wrote an anti-Bush "metal folk protest album" in a week or so — he got fed up waiting for a younger singer to do it — recorded it in five days at the start of this month, and it will be in digital stores next Wednesday. At 60, he's done it again. They're leaving no 21st Century promotional stone unturned. Here's the blog, the MySpace profile, the YouTube interview (worthwhile just for the CNN interviewer's question, "there's a song called Let's Impeach the President — what is this song about?" and Neil's predictable response). 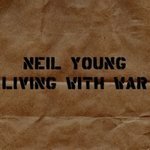 As of today, the full album is streaming from the Neil Young web site, though the buffering of tracks is slowing as more of America wakes up (the double entendre was unintentional and probably wishful). And it's streaming from this site too — just click the album cover above. They've given bloggers and MySpace members the tools to promote the album on their sites and pages. 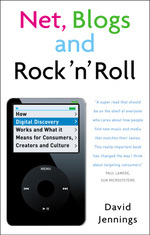 Would now be a good time to mention that I'm cited in one of Neil Young's biographies? Granted, it's not one of the more recent (and better-known) biographies, but if you've read Jimmy McDonough's, Johnny Rogan's and Scott Young's, and you still want more, check out David Downing's A Dreamer of Pictures . Look me up in the index: you'll find me between Jefferson Airplane and Jennings, Waylon.